And this was achieved without selling a single SUV. With 2017 now a distant memory, automakers will be evaluating last year’s sales figures. While overall car sales in the US were down last year compared to 2016, Aston Martin has cause for celebration. Why? Because the company enjoyed its highest full-year sales volumes in nine years without selling a single SUV. According to the automaker, overall sales were up 58 percent on last year with 5,117 sports cars sold in 2017 - the first time Aston Martin has sold more than 5,000 cars since 2008. And it’s all thanks to the DB11. Aston Martin cites “sell-out demand” for its V12-powered DB11 grand-tourer as the primary reason for its sales growth, along with limited-production specials like the Vanquish Zagato and Aston Martin Vantage GT8 which doubled in sales over the previous year. 2017 earnings before interest, taxes, depreciation, and amortization are reported to be at least £180 million, which is around $243.7 million. “We continue to perform ahead of expectations, both in terms of financial performance and in meeting our targets for the DB11 and special vehicles,” said Aston Martin CEO Andy Palmer. “This strong sales performance shows that our Second Century transformation plan is building momentum. 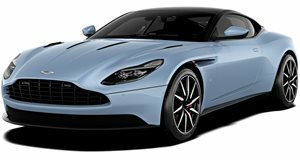 Phase Two of the program will be largely completed in 2018 with the introduction of the Vanquish replacement and production of the new Vantage, contributing to continued sustainable profitability at Aston Martin.” Its line-up will continue to expand with exciting new models like the new Vantage and Vanquish featuring more distinctive designs that should help further increase the automaker's sales, as well as production of the V8 DB11. The fact that Aston Martin achieved this sales milestone without an SUV in its line-up is commendable – but we know that will soon change when the upcoming DBX crossover goes on sale in late 2019 or early 2020.